Cannabis earned the nickname “weed “because of how easily it grows. But, when you want to control the elements and environment, you have to restrict the external forces available. Many growers turn to indoor gardening for any number of reasons. No matter the reason that has you growing indoors, we have the best grow tents available reviewed here! What makes a good grow tent? Clearly, if you purchase something to assist your indoor gardening, you don’t want something that you could have constructed on your own. You should expect a grow tent to assist your grow lights and more. Growing indoors is satisfying but requires controlling the temperature, light exposure, and humidity. A grow tent should make growing indoors easy. Not to mention the very strong odor that comes during the mature stage. Size is the most important aspect to consider when buying your grow tent. Because you are probably dealing with some sort of size restriction, you should measure your space, and account for the need to walk around the tent as well. All of the top choices for grow tenitssizets provide every one of these benefits. All you must do next is decide which is the best option for you and your plants! The issue of how easy the tent is to use comes up only after many people already purchase their grow tent. There are 3 concerns here that run in the same vein. First, there’s the issue of it being difficult to get into the tent. Most grow tents use zippers which can get stuck or jam. But, the alternative is Velcro, ties, or snaps all of which let in light. Zippers are your best bet, just look for quality. The second area of concern with ease of use is cleaning. If the grow tent isn’t easy to clean you could be left scrubbing for hours. Most of the interior materials on these grow tents is mylar. Typically, mylar is very easy to clean and wipes down with mild soap and water. Finally, the last ease of use issue is setup. Most of these tents come with very clear instructions for assembly. However, if you need something that’s easy enough to snap together you should look at the smaller tents. Typically, larger tents require far more assembly, and that can become difficult. The best grow tents deliver value, at great prices, and offer all the benefits you’re looking for. These options are all great, but each one works best in different situations. Use your available space and current lighting equipment to decide which is the best light for you. There’s so much to enjoy from the CoolGrows small indoor mylar hydroponics grow tent. If you’re looking to grow using hydroponics this tent, ensure that there’s no unnecessary spillage. This tent also helps scatter light well with a reflective interior. The inside is very durable built with a heavy-duty metal bar structure and connectors. With this structure this grow tent should last for a number of years and through many grow cycles. The viewing window also ensures that you’re not unnecessarily disrupting the environment. With the viewing window, you’re not upsetting the white light and robbing your plants of precious UV rays. Speaking of precious light, the interior is 99% reflective. The reflective interior also prevents light from escaping. 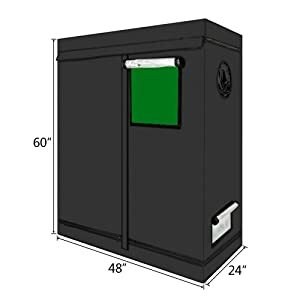 If you need a small grow tent, this is a great option. Because of its size, you wouldn’t typically expect this level of durability. But the all metal frame, and connectors make it a grow tent you can use for years. So, if you don’t plan on increasing the size of your growing area anytime soon, this tent is a quality investment. It’s important to note that the CoolGrows small tent prevents light from escaping while also magnifying the light that’s in the tent. The interior is 99% reflective to ensure that your plants get all the light they can. This is hands down one of the most important features of a grow tent. The price of the grow tent is put off severely by the cost of the LED panel that comes with the package. If you haven’t purchased lights yet, this package could be the perfect combo for you. The LED light panel is high-end, and the tent is top quality. The tent is 4 feet by 4 feet, and it’s very easy to assemble. The tent comes with a duct fan and carbon filter. The carbon filter words to help the air supply remain pure, as well as contain the smell of 4 mature plants. If you already have a light system you love, then there are only a few benefits you’ll get from using this grow tent. 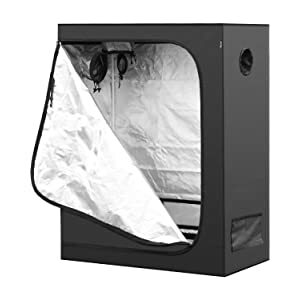 Although this is one of the best grow tents available, the LED light panel hikes up the price a lot. However, if you haven’t purchased lights yet, the 750-watt panel has a full spectrum so that you can use them from seed to flowering. The light panel easily covers 6 square feet, but within the reflective interior of the Gorilla Grow Tent, these light scatters throughout the plant growth. Overall, this is a great buy at an amazing price if you also need lights. Otherwise, the grow tent is impressive and high-quality. The Vivosun large tent holds up to 6 fully mature plants without crowding. The height allows you to hand lights over plants even when they’re at their full height. Vivosun stands out from the rest of the competition by offering a 2-year warranty on the tent itself. The inner fabric is 98% reflective allowing your lights to work less throughout the day. The dark exterior also ensures that no light escapes. There’s also a removable floor tray to support plants or hydroponic trays. The Vivosun large grow tent your standard grow tent. There’s not much more to it other than a reflective interior, thick canvas exterior and viewing window. This grow tent is the option for someone who wants to grow multiple plants indoors. There are other options available with more bells and whistles, but the simplicity of this design makes it stand out. It doesn’t need all the features because it’s high-quality, by design. There are strong support beams and a floor tray to ensure that your grow tent will last for years! The Oshion small indoor mylar hydroponics grow tent room is a bit different than the other tents on our list. Instead of unzipping to reveal a door like structure, the whole side panel unzips so you can have full access to your plant. Although this is the smaller version, there are many sizes available. With a structure of 600D materials, the entire grow tent room very stable and sturdy. The materials Are 99% reflective which is optimal for your plants. That way all the light stays in, and hit’s your plants encouraging growth. The best part about the Oshion small indoor mylar hydroponics grows tent room is that the setup is really easy. It only takes 20 minutes to setup, and the instructions are very clear. This is a simple, sturdy, and high-quality grow tent. The design of the Oshion small indoor mylar hydroponics grows tent room makes it easier to access your plants without having to stoop or struggle into a small tent. The entire tent is easy to clean, as you can wipe own the inside without any problem. 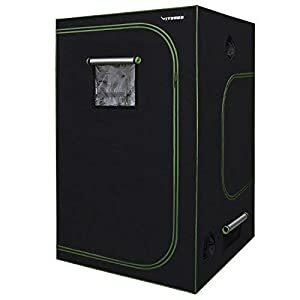 The design makes this grow tent look more like a wardrobe from the outside, so if you’re trying to grow discreetly, you don’t have to worry. The air vents also help keep the air from going stale. Because of its sturdy construction, the Oshion small indoor mylar hydroponics grow tent room will last for many grow cycles. The iPower Hydroponic Water-Resistance Grow Tent is tear proof, easy to clean and stable. If you were to choose the iPower Hydroponic Water-Resistance Grow Tent, you’d find the construct is secure and reinforced with metal poles. Unfortunately, the low price is all too telling. The other options on this list offer 98 or 99% relativity inside the tent. However, this grows tent only provides 95% reflective interior. Now, 95% isn’t bad, and it still made the top 5 for this list. The iPower Hydroponic Water-Resistance Grow Tent will help keep your grow happy and healthy without draining your electric bill. The thick tent material will help you maintain a grow environment, and it will keep your tent working for years. For a medium sized option, this tent is high-quality with a few features. The best feature you could ask for from a grow tent is that it keeps all the light in. Regarding preventing light from escaping the iPower Hydroponic Water-Resistance Grow Tent is one of the best options. Other features that the iPower Hydroponic Water-Resistance Grow Tent has is that it keeps odors contained well. If you’re attempting to grow discreetly but have a bit of substantial space to work with this tent is a great option. Its sturdy construction reinforces the stability of the structure. The air vents thoroughly which are fantastic to prevent the air from going stale. The downside of needing 2 people to adjust the height is a real hinderance though. 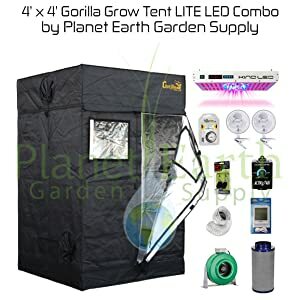 The clear winner here is the Gorilla Grow Tent. There are multiple size options available however the tent, and light combo found on this list stands out for a few reasons. First, the lights it comes with are high quality and cover a wide surface area. 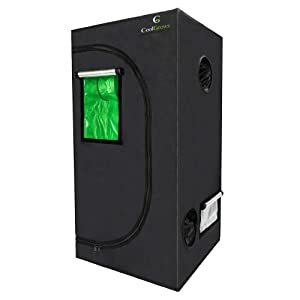 Second, the grow tent has an inline duct fan that uses an active carbon filter. The fan is adjustable and has a timer. Finally, it’s easy to get in and out of. The zipper doesn’t stick, and you don’t have to stoop over to tend to your plants. The best grow tent depends on what size of space you have, regardless of whether you’re a newbie or an expert. Every one of the options listed here delivers several features to help you’re indoor grow environment. The only thing left is to decide which is the best option for you and your plants.